China wants to expand its military access to the Indian Ocean region and may set up access points or replenishment bases in India’s vicinity within the next 10 years, the Pentagon has said in a new report. The annual report on military and security development involving China that is prepared for the US Congress says Beijing has started sending its Navy out to the Indian Ocean with its first nuclear submarine deployment in 2014 and over the next decade, the People’s Liberation Army Navy will expand its logistics in the region. 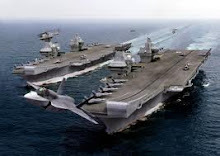 This expansion will see China setting up replenishment bases in the vicinity of India, in a region that New Delhi considers its backyard, but will fall short of a full spectrum of support extending to rearmament of warships, the report says. “China desires to expand its access to logistics in the Indian Ocean and will likely establish several access points in this area in the next 10 years. These arrangements likely will take the form of agreements for refuelling, replenishment, crew rest, and lowlevel maintenance,” the report says. The Pentagon, the headquarters of the US Department of Defense, has taken note of China’s increased naval deployment in the Indian Ocean region, pointing out that in 2014 it deployed its submarines in the area for the first time “ostensibly in support of its counterpiracy patrols”. It has identified the boats as a Shang class nuclear-powered attack submarine and a Song class diesel-powered attack submarine. The US estimates that the submarines were “conducting area familiarisation, and demonstrating an emerging capability both to protect China’s sea lines of communications and increase China’s power projection into the Indian Ocean”. On the Chinese nuclear programme, the Pentagon believes that the country has managed to create a new generation Multiple Independently targeted Reentry Vehicles (MIRV) warheads that are spurred by US, Russian and Indian nuclear forces.